Réal not only rides at Lancers but is one of our “re-riders” who has recently come back to riding after a number of years off. Now that she is back, she has already jumped in full force as an active volunteer at the barn! She is helping with our Musical Ride, has agreed to chair our Downtown Horse Show Committee (which her background as an event organiser is a great asset), and she plans to attend many off-property horse shows to help any way that she can! We are particularly fortunate to have Réal back because as a child, Réal was very involved in the Lancer community as a youth. Between 1994 and 2004, she participated in Junior Executive, Pony Club, Musical Ride, and horse shows, and was even a stable hand on Sundays! She knows the ropes. Even with her break, Réal has been able to jump right back in the saddle and now rides in J3. While she has only been riding again since February, Réal actually began riding at Lancers in 1994 when she attended Lancers’ beginner summer camp (a photo of her first ride is below! ), and stayed on to move through the ranks. Over the years, Réal has had many favourite Lancer horses including Freddy, George, Sparky, and Thelma from her childhood. While she hasn’t been back long enough to have a new favourite, Réal says she enjoys riding Rupert and Rainy because of the challenges they present. 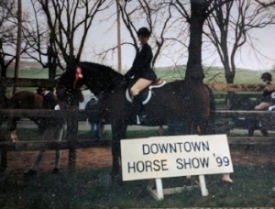 Sparky is foremost in Réal’s favourite memories of Lancers as she recalls winning her first red ribbon with him in the Downtown Horse Show in 1999 (photo below). Other favourite memories include riding in the Musical Ride with the RCMP and showing Thelma at an off-property show (photo below). Réal recounted, “We were having a difficult day and she did not even want to go into the ring. We were able to make it around the course and even won some ribbons. I was particularly proud because we were able to overcome the challenges that day”. When asked what she enjoys most about Lancers, Réal explained, “I have always loved horses and being a member of Lancers has allowed me to grow up with them. I have learned so much over the years and being a part of the organization has taught me a sense of responsibility”. In the future, Réal would like to continue riding at Lancers and work towards obtaining her rider levels with the ultimate goal of certifying as an instructor. Overall, Réal chooses to volunteer at Lancers because “it allows me to combine my love of horses and learning with the opportunity to give back. I hope that through volunteering I will be able to help others have the same wonderful experience I had growing up”. In this, Réal exhibits the real Lancer spirit - someone who wants to learn, lead, and find ways to give back to the community. When not at the barn, Réal enjoys hiking, camping, canoeing, and spending lots of time outside with her dog! Thank you, Réal, for your many years of service to Lancers and for coming back to ride again!